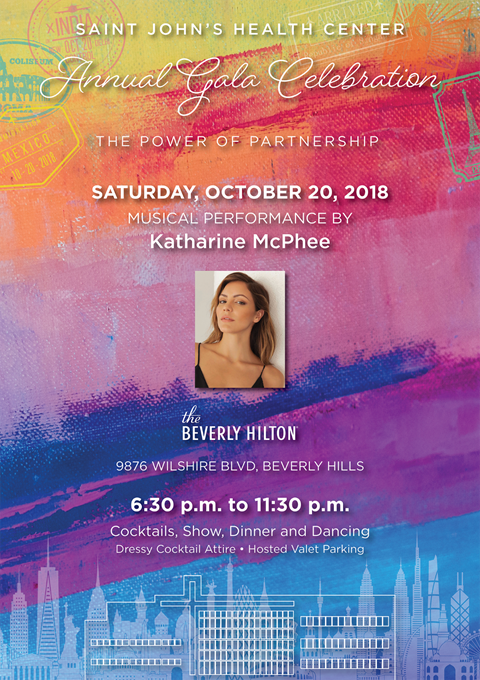 Saint John’s Health Center Foundation and Irene Dunne Guild are proud to announce the 2018 Gala "The Power of Partnership" taking place on Saturday, October 20 at the Beverly Hilton. This year's gala honors the people of Saint John’s who make the difference – physicians, researchers, staff, trustees, volunteers and grateful patients – all working together to save lives. Net proceeds will benefit vital programs, services and greatest needs within distinguished areas of excellence at Saint John’s Health Center including cancer, cardiac care, maternal and child health, men’s health, neuroscience, nursing, orthopedics, thoracic surgery and urology. The chart-topping recording artist and actress Katharine McPhee will perform at the annual gala celebration. Leadership support for this year’s event includes Irene Dunne Guild gala chair Christina Arechaederra. Christina is supported by the gala committee including Maria Arechaederra, Sylvia Balbona, Jane Loh, Cheryl Robertson Thode and Kathy Yawitz. This year’s Dinner Chairs include Kathy and John Danhakl, Lynda Oschin and Jerry B. Epstein, Mary and Jay Flaherty, Martha and David Ho Family, Robert and Elizabeth Lowe, Teresita and Shelby Notkin, Dominic Ornato, and Donna Schweers and Tom Geiser. Individual tickets to the October 20th Gala Celebration are $750 and sponsorship packages are available. ​For more information, please contact Tess Csiszar at Saint John’s Health Center Foundation at 310-829-8168 or email Tess.Csiszar@stjohns.org. For more information, visit www.SaintJohnsFoundation.org. There's still time to support Saint John's and make this year's gala even more successful. "Other" - "2018 IDG Gala".